It is that time of year in D.C. when all the cherry blossom trees start to bloom. I am so excited! I'm also excited to be running the cherry blossom 10-miler on April 11. I tried to train for it last year and then suffered some serious back pain. I re-trained for the Army 10 miler and now I feel totally fine about running another one. Predicting the peak blossom time is always a fun sport for Washingtonians. This year, they have predicted that it will be around April 1. That's rather early, if you ask me, but I'm fine with that. I promise lots of photos to come! 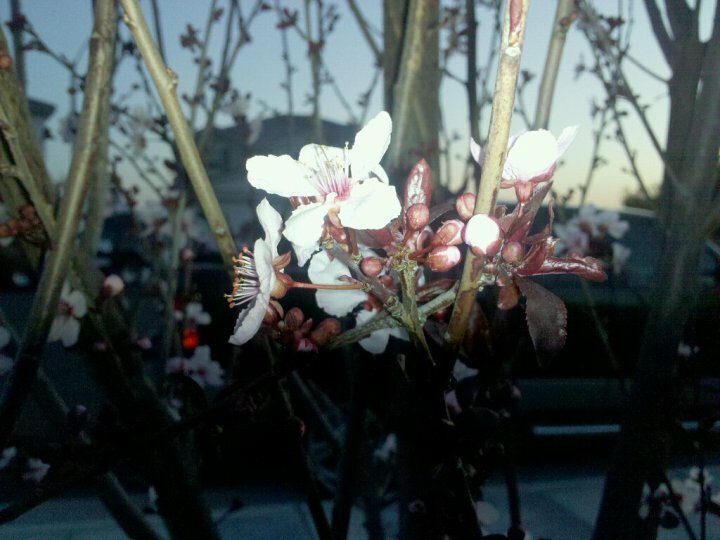 I took this photo of the tree in front of my parents house because it sort of looked like a cherry blossom tree. I'm doubtful that it is ... looks more like a plum blossom tree or something ... but it definitely got me in the mood when I saw it two weekends ago! peak blossom april 1? damn al gore!